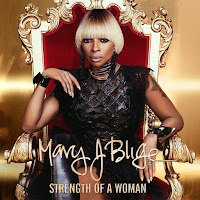 Mary J Blige Announces New Album "Strength Of A Woman" And Release Album Release Date !! Mary J Blige Announces New Album "Strength Of A Woman"
And Release Album Release Date !! BHR Hollywood Reports...........Mary J. Blige is returning for your listening pleasure with a new album called Strength of a Woman. The LP is due out April 28, according to a post Blige made on Instagram sharing the release date and cover art. The Queen of Hip-Hop Soul has announced an April 28 release date for the project and revealed the cover art, which shows Blige seated on a golden throne. Last year, Blige released the Sullivan-penned single “Thick of It,” inspired by her divorce from her husband of 12 years, Kendu Isaacs. She followed it up with “U + Me (Love Lesson),” which also reflects on the end of her relationship. The album is likely to carry some of those themes over, as well. Speaking of the title, Blige explained that it’s meant to symbolize power in the face of tribulations. “We find that strength in us to not just survive these trials, but to thrive, to live, to get something out of it to not make the same mistakes again,” she said.